Semi & Custom cabinetry makes a unique statement within your home. Whether it includes custom moldings and door styles, innovative storage solutions or an elegant special finish, details are what custom cabinets are all about. We work with cabinet makers whose craftspeople use only superior materials and woodworking skills, along with the most advanced technology, to create your cabinetry. The result is furniture-quality cabinetry in your choice of styles, finishes, colors, woods, laminates, moldings and hardware. Our custom cabinet line has been awarded the KMCA Environmental Stewardship Certification by meeting a stringent set of environmental criteria to promote the sustainability of natural resources. We work with you to select the right cabinet solution to greatly improve storage capacity and to make your new bath or kitchen more useful and up-to-date. Not only are you increasing the aesthetic appeal, but also the equity in your home. If you are remodeling, we can work with you from the beginning to make sure your cabinets fit with the rest of the room’s layout and with any new or existing appliances and/or fixtures. 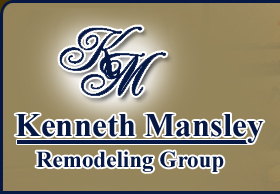 Kenneth Mansley Remodeling Group is a member of the National Kitchen and Bath Association which represents the finest kitchen and bath professionals in the industry.